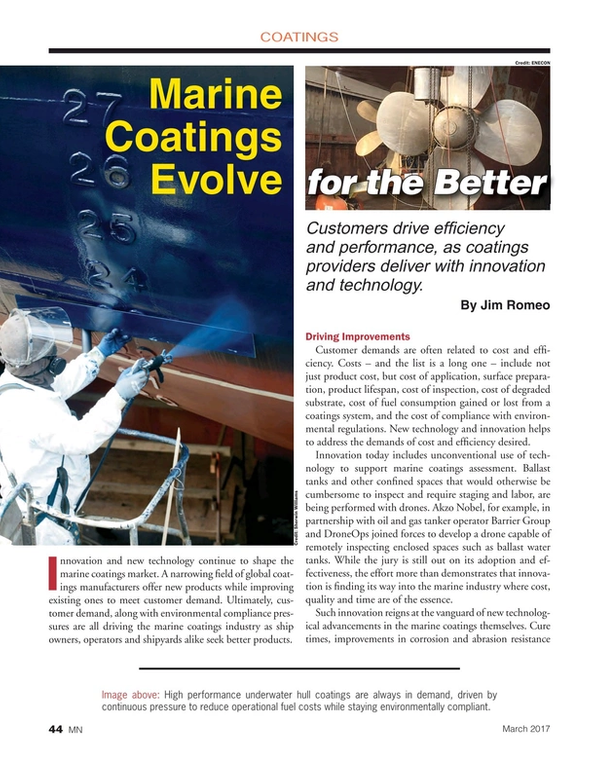 Innovation and new technology continue to shape the marine coatings market. A narrowing field of global coatings manufacturers offer new products while improving existing ones to meet customer demand. Ultimately, customer demand, along with environmental compliance pressures are all driving the marine coatings industry as ship owners, operators and shipyards alike seek better products. Customer demands are often related to cost and efficiency. Costs – and the list is a long one – include not just product cost, but cost of application, surface preparation, product lifespan, cost of inspection, cost of degraded substrate, cost of fuel consumption gained or lost from a coatings system, and the cost of compliance with environmental regulations. New technology and innovation helps to address the demands of cost and efficiency desired. Innovation today includes unconventional use of technology to support marine coatings assessment. Ballast tanks and other confined spaces that would otherwise be cumbersome to inspect and require staging and labor, are being performed with drones. Akzo Nobel, for example, in partnership with oil and gas tanker operator Barrier Group and DroneOps joined forces to develop a drone capable of remotely inspecting enclosed spaces such as ballast water tanks. While the jury is still out on its adoption and effectiveness, the effort more than demonstrates that innovation is finding its way into the marine industry where cost, quality and time are of the essence. Such innovation reigns at the vanguard of new technological advancements in the marine coatings themselves. Cure times, improvements in corrosion and abrasion resistance improvements, edge retention, surface tolerance, ease of mixing and application, and product traits and characteristics all translate to not only improved performance for the coating, but also improved operations and maintenance for the ship’s stakeholders. Maintenance painting, for example, is typically conducted shipboard, mostly without outside assistance. Maintainers – often seafarers – prepare surfaces, and mix and apply the paint themselves. They seek products that are durable, tolerate different surface preparations and environmental conditions and are easily resealed without wasting much product. Akzo Nobel’s Intershield One-to-One product, for example, is a single coating solution that serves as a universal primer. It can be used for numerous applications for onboard maintenance painting. It reduces onboard paint stores because of its versatility and ability to use, then reseals the container for storage and later painting. It also avoids the problems that may arise with two-part primers that can be difficult to prepare and apply. In addition to primers, topcoats and various epoxies, underwater hull, waterborne coatings are continuously introduced with better overall characteristics. After all, underwater hull coatings systems and antifouling coatings and their application are expensive. However, underwater hull painting systems can add tremendous value through extended service life between recoats, reduced drag, better fuel consumption, and environmental compliance, better reliability through its life. High solids and ultra-high solids coatings are also becoming important in coating applications where corrosion, friction and abrasion as well as other severe service comes into play. This is true for coating hull fixtures such as rudder pintles, corrosion-prone tanks, and other applications requiring a most durable coating. With high performing high solids coatings maintenance costs are reduced and overall reliability of the ship is increased. And, then, there are underwater hull coatings – anticorrosive coatings as well as antifouling coatings. Market research firm Technavio, in their research, reported that antifouling coatings are gaining a crescendo of attention and scrutiny when it comes to environmental concerns as well as an underwater coating systems’ help in conserving fuel via reduced friction and drag. Niches within the marine industry are leading the emergence of product innovation. “Offshore oil rigs are the key to exploration and extraction of oil and natural gas. Antifouling coatings are used in rigs to increase performance and durability. Expansion of the oil and gas industry due to increased exploration of oil and gas is expected to increase the demand for rigs, opening up immense opportunities in the market,” said Chandrakumar Badala Jaganathan, of Technavio. In addition, to environmental and fuel consumption, the longevity of an underwater hull systems is key. Antifouling paint that may be applied with proper quality assurance, and remains intact and reliable adds value. And the longer it remains intact may allow owners to forego a complete recoat and operate without much costly maintenance between underwater hull coatings. While innovation and the development of new and better products and coatings technology continues, the overall global supplier base for marine coatings remains narrow. The global waterborne coatings market consists of several key players, and operates in a highly competitive market. These include Akzo Nobel, Axalta Coating Systems, BASF, PPG Industries, RPM International, and Sherwin-Williams. While these vendors have a large global presence, there does exist a number of small regional vendors with respectable market share, offering proximity to their end users and customers. However, a narrower supplier base reduces competition and can strain prices and new technology for shipyards and subsequently ship owners and operators. “While Akzo Nobel led the global paints and coatings market with a share of 16 percent in 2013, PPG Industries took the lead in the market in 2015 with a share of 17 percent. The vendors are focusing on increasing their market share through mergers and acquisitions,” says Swapnil Tejveer Sharma, also from Technavio. Separately, Bob Marangiello, Regional Sales Manager for ENECON, said, “The supplier base seems to have shrunk considerably over the past several years with larger companies acquiring others to control and increase their market share.” He adds, “Hard to say, it almost seems to be a deflationary pricing structure in effect, whereas you keep what you have and not chance losing a customer.” ENECON offers a portfolio of coatings products, including high solids coatings for severe and durable service applications. Coatings suppliers must not only produce competitive products, but also meet demand for environmentally compliant applications. This includes regulatory compliance as well as carbon credits and other considerations for manufacturers imposed by organizations such as U.S. EPA, IMO and other regulatory bodies. Environmental requirements drive coatings manufacturers to produce sustainable and eco-friendly antifouling coatings. Biocides contained within the coating prevent the development of growth, but their leaching into the marine ecosystem can be harmful. Hence, manufacturers continue to produce biocides which either adhere to the hull without ablating, or developing coatings that provide a sleek underwater hull that inhibits marine growth while improving laminar flow. In spite of new and innovative technologies, shipyards, maintenance facilities and vessel owners and operators are intent on maximizing their marine coatings purchase. Thrift, when it comes to marine coatings and their application, translates to cost savings, which has become a welcome note for vessel owners who seek to find any solutions they can to operate with strained budgets in an increasingly regulated environment. There is always a paradox between ship owners and main coatings manufacturers. Manufacturers produce better products to meet customer demand and make a profit. But, create a better product that lasts longer and you won’t paint as often and will need less paint, less often. If priced according to value, supply will adequately meet demand.